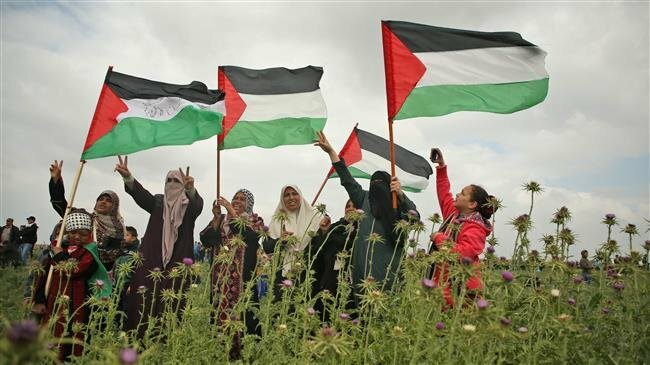 As we approach the first anniversary of the Palestinians’ Gaza-based “Great March of Return ” mass nonviolent action, Just World Educational has been preparing a lot of GMR-related informational resources that English-speaking people around the world can use to understand more about the situation in Gaza and the goals of the GMR. 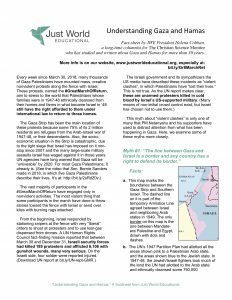 ** We recently updated and reformated the factsheet “Understanding Gaza and Hamas” that we first released last spring. Download a PDF version of this 4-side letter-size factsheet here. We’re having a bunch of these professionally printed as an attractive bi-fold; and they should be available very soon. If you want to order some for your community group, congregation, or classroom, drop us an email. We ask you to help us cover the costs by paying $1 per bi-fold plus shipping costs.